By now, you’ve probably seen the Tweets, read the quotes, or listened to the proclamations coming from the Vatican. The Pope has decided to embrace the global warming faith, attack capitalism, decry the successes of western nations, and rail against guns, gun manufacturers, and those who support the industry. In short (abortion and gay marriage aside) he’s taken a turn to the hard-left. In the span of a decade, we’ve gone from a Pope teaming with Reagan to defeat the Soviet Union to a Pope who embraces the classist financial rhetoric of our old enemies. That’s troubling, but it’s not really the problem. The Pope is free to say, believe, and claim whatever he likes. If Catholics don’t like it, they’re free to reject it and walk away. As HermanCain.com’s resident Catholic, it’s a decision I’ve been forced to wrestle with myself. Shut your mouth and stick with the church, or stand your ground and refuse? I’ve made my decision, and we’ll get to it in a moment. 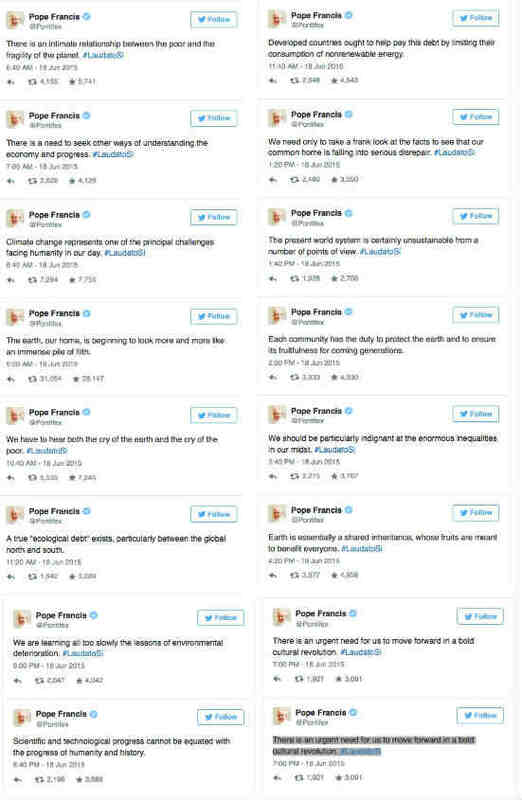 ...But first, let me say that the Pope’s comments are only the beginning of the issue. The real problem lies deeper within the Catholic hierarchy. There’s more, including a few things that any sane person would agree with, but you get the drift. Production and consumption are killing the planet, the Northern Hemisphere “owes a debt” to the Southern, and he’s taken the AGW bait 100% hook-line-and-sinker. Yesterday, he dug his left-wing hole a little deeper by going after gun manufacturers, sellers, and investors. People who manufacture weapons or invest in weapons industries are hypocrites if they call themselves Christian, Pope Francis said on Sunday. Francis issued his toughest condemnation to date of the weapons industry at a rally of thousands of young people at the end of the first day of his trip to the Italian city of Turin. “If you trust only men you have lost,” he told the young people in a long, rambling talk about war, trust and politics after putting aside his prepared address. “It makes me think of ... people, managers, businessmen who call themselves Christian and they manufacture weapons. That leads to a bit a distrust, doesn’t it?” he said to applause. The left, obviously, is overjoyed. Hillary Clinton and Nancy Pelosi spent the last three days praising this. Of course they ignore the Pope’s constant stand on homosexuality, gay marriage, and abortion, but all of a sudden they love his “scientific awareness.” This alone should serve as a warning that we have a major problem, since even as a Catholic I readily admit that the church and science have -at best - a tortured relationship. I could point out that issuing screeds about “financial inequality” while he’s seated atop the Vatican’s Scrooge McDuck-style money vaults might be an example of the exact same type of hypocrisy. Or, I could argue that a man whose organization currently maintains a massive fleet of luxury cars, boats, helicopters and jets, shouldn’t be lecturing people about the piety of limiting fossil fuel consumption. Heck, I could even ask how the Vatican City security forces are enjoying their armory of firearms made by Glock, Berretta, and Heckler & Koch. But what would be the point? Of late, it feels like the Pope makes his decision on these matters, and the Priests, Bishops, and Cardinals who serve him line up in silence. If the entire church hierarchy is set against dissent, why bother fighting? This brings us to the real problem I mentioned above. I have it on good authority, from people I trust, that dissent is everywhere within the church. Just as politics divide people in the secular world, they divide people in the spiritual one. However, I’m also hearing that no one is willing to speak out because they’re afraid of losing their jobs. ....And that’s the real problem. The Bible doesn’t focus on a bunch of go-along-to-get-along weaklings. We don’t line the pews every Sunday thanks to a gang of mealy-mouthed cowards. Our faith hinges on people who were willing to sacrifice everything for what they believed. I expect a person who takes to the pulpit every Sunday to follow their lead. I have no respect for someone who’s willing to stand up there and preach about the convictions of saints, apostles, and Christ himself - all while refusing to speak out about their own beliefs because they’re afraid to lose something as base and petty as a job. I mentioned before that I’ve made my decision about the church. It’s this: I’m not interested in being part of a group which is trending both anti-capitalist and anti-West. I’m also not inclined to ally myself with Priests, Cardinals, and Bishops who are unwilling to speak their minds. This isn’t a rejection of faith, or of Jesus, or of God. I’m not turning my back on the Bible or its teachings. I’m simply acknowledging that, until it corrects its course, a socialist Pope sits atop an organization that’s heading down a path I can’t - and won’t - follow.